The “Dwarf Garden” at the John and Mable Ringling Museum begs no question. It is not an alternative semiotics of our domesticity. It isn’t a metaphor for government. It is, of course, culture itself—an arrangement, a contraindicated tableau of our mortality. Since I’ve been here I walk among the stone dwarves and think of the tears we shed because, as William Butler Yeats said, we are attached to a dying animal. What can culture do to pay homage to the soul? The soul, that terrible thing, so bitter and slick—yes, if the soul had a flavor it would be a very dark gum, a thing like alum and gutta percha. The stone dwarves are Italian imports and hearken to the days of the commedia del arte. One thinks of Pulcinella, the stock figure of Italian comedy, hump backed, lascivious, lively and naughty. 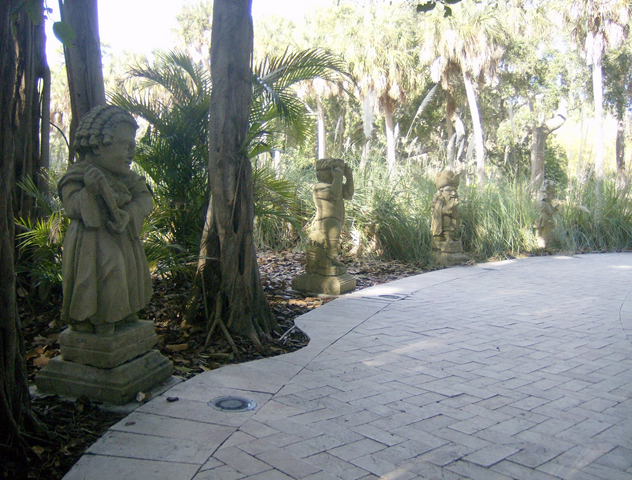 You can walk among the little rogues on the grounds of the Ringling Museum. As a disability studies scholar I invariably think of Derrida. These stone figures are arranged so as to suggest a concatenation of deities—they are the temple of the Id. The serpentine path says they are among us but they are not us. They are like the animals, they are well dressed creatures of primitive caste. But look how artfully they are arranged! In this way they are the tutelary gods of the circus itself. The real history of little people is a complex affair. The controlled, augmented serpentine walk can only hint at the shivers. Thanks for getting back, i love the term you use i shall be using that in future. The statues should look a bit ghostly as the dusk is setting in with the lights shining up. Hello Duncan. Believe it or not, it is light. The Dwarf Garden is illuminated at dusk. Does the term “fetishization” seem useful? What is that in front of the statue, is it a light in the ground or a watersprinkler?